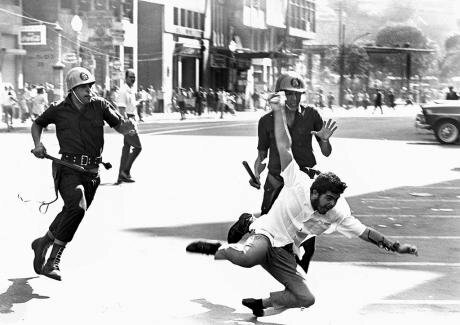 Repression in Rio de Janeiro on June 21, 1968, which became known as "Bloody Friday". "I am going to turn this country into a democracy and if someone is against it, I'll stop them and crush them." Manuel Serrano: Jair Bolsonaro has been elected president of Brazil. What does his election mean for your country, for Latin America and for the future of democracy in the region? Reginaldo Nasser: When former President Nixon was asked, in the 1970s, if he feared that Brazil would become a "new" Cuba, he said no. He said that he feared, in fact, that Brazil could become a "new" China. Bolsonaro’s election will have consequences for all the countries in the region, even though each country has its own peculiarities with regards the role of the military, the elites and the different sectors in society. Historically, the dictatorship in Brazil, unlike countries like Argentina or Chile, has always been a red flag in order to allow a degree of conciliation between the different social classes. It is a pending question which has made this force suddenly reemerge. Although it appears to be a transitory wave, it will be so only if there is resistance and mobilization and if these count on international allies. Manuel Serrano: Several analysts describe the new president as the "Trump of the Tropics." However, you recently wrote that "Bolsonaro tries to mimic Trump's language and style, but he seems to forget that he is not the leader of a world power". Where do the similarities between them begin and end? Although it appears to be a transitory wave, it will be so only if there is resistance and mobilization and if these count on international allies. Reginaldo Nasser: For now, comparisons can be made only in relation to the election campaign. It is quite likely that Bolsonaro will decide, when he accesses power, to keep on imitating Trump's style of contempt for the mainstream media and of using Twitter as an informal means of communication, through controversial and shocking phrases which help to divert attention from the country's real problems. Manuel Serrano: What do you think about the appointment of Judge Sergio Moro as Minister of Justice? Is this the "fraud of the century"? Does this cast doubt on the investigation of the Lava-Jato operation and the impartiality of the Brazilian judicial system? Reginaldo Nasser: I think that the appointment of Judge Moro as Minister of Justice is part of a plan that has been in the making for some time. Just like with a big jigsaw puzzle, the pieces are fitting together little by little. It all started with the mensalão, and everything that has come after that has gone in the direction of the main objective: to prevent the PT from returning to power. The coup against President Rousseff showed that there are broad sectors of society combined with different structures of the State – the police, the judiciary, parliament – trying to get the PT out of power, making use of the constitution and the law. The incarceration of Lula confirmed both the objective and the approach. Vice president-elect General Mourão acknowledged that Judge Moro was consulted during the election campaign. The coup against President Rousseff showed that there are broad sectors of society combined with different structures of the State trying to get the PT out of power. Manuel Serrano: Bolsonaro’s program includes measures that run counter to the rights set forth in the Brazilian Constitution. The right to life, for example, would be violated if the police were allowed to "kill at will" in the exercise of their functions. Do you think that the Supreme Federal Court will be able to prevent the President from violating the fundamental rights of Brazilians? Reginaldo Nasser: I think that Bolsonaro’s government will find resistance within the judiciary, especially in the Supreme Federal Court (STF). Recently, Minister Carmen Lúcia determined, by way of a preliminary decision, that the only legitimized force to "invade a university is the force of free and plural ideas." This decision guarantees the free expression of thought and ideas and therefore opposes the decision of the electoral judges, who authorized the search and seizure of pamphlets and campaign material in universities and teachers' associations and prohibited electoral issues in the classrooms, in addition to meetings and political assemblies. This is a positive decision indeed, but it shows that there are sectors within the State that systematically threaten the rule of law. The only legitimized force to invade a university is the force of free and plural ideas. Manuel Serrano: How come the far right has reached power in Brazil? What causes proved to be the main catalysts for this result? Reginaldo Nasser: For some time now I have been studying the question of the counterrevolution, which is something that currently attracts very little attention. If we analyze the works of Marx, such as the Manifesto of the Communist Party and Louis Bonaparte’s 18 Brumaire, we can appreciate his concern for counterrevolution. We must be conscious of the fact that counterrevolution exists regardless of whether the revolution has been successful or not. In Brazil, what happened was a process that, timidly and in a conciliatory way, promoted the fight against poverty and the access of the less well-off to higher education. This process also allowed significant profits for the business and financial sectors. This small revolution provoked however a reaction when the right circumstances arose, which is something that usually happens at times of economic crisis. It was at then that the elites reached a consensus agreement: to put an end to the PT era. What happened, though, was that during that movement, the far right advanced beyond what many had expected. Counterrevolution exists regardless of whether the revolution has been successful or not. Many journalists, politicians and even some activists who helped in promoting anti-petism are now regretting what they did. But let us not be deceived: these sectors will happily adjust to the situation if things are "going well". Jair Bolsonaro during a plenary session of the House of Representatives to celebrate the 30º anniversary of the Constitution. Geraldo Magela/Agência Senado/Flickr. Some rights reserved. Manuel Serrano: Polarization, attacks on the press, the military in government. Is this the way in which democracies commit suicide? Reginaldo Nasser: When we analyze the advances and setbacks in history, we must always correctly place the situation in context. It is unquestionable that the constitution of 1988 and the process of social and political mobilization after the civic-military dictatorship produced some significant advances and generated a number of social movements, such as the Movement of Rural Landless Workers (MST) and the Movement of Homeless Workers (MTST). However, at the same time, democracy deteriorated over time in different ways. Despite the progress made during the PT governments, Brazil is today an extremely unequal and violent country, where those footing the bill are usually the most vulnerable. What is emerging now is the tip of the iceberg of the reaction by the most conservative sectors of society to years of progress. We are witnessing how some groups seek a settling of scores: against universities, against LGBT movements, against the free expression of ideas. Despite the progress made during the PT governments, Brazil is today an extremely unequal and violent country, where those footing the bill are usually the most vulnerable. Manuel Serrano: A year ago, we were discussing about fake news and the bias of the media in Brazil. What influence have these factors had in the elections? Reginaldo Nasser: In these last elections, it was social media, especially WhatsApp, that has been truly decisive as opposed to huge media giants. 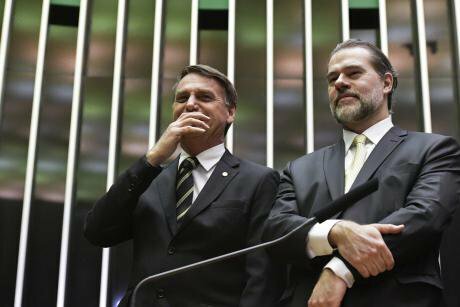 Many analysts commented that Bolsonaro's candidacy would not take off because he did not have enough space in the allocated electoral time in the media. But his supporters, rooted in a very well organized industry, had a decisive influence. A journalist of Folha de São Paulo, Patrícia Campos Mello, revealed how fake news was used to boost Bolsonaro's campaign. The elections also showed the inability of the judicial institutions to contain this. In December of 2017, a report by BBC Brazil revealed that electoral and public opinion manipulation strategies have been used in Brazil since 2012, a threat up-against the passiveness of the authorities. In these last elections, it was social media, especially WhatsApp, that has been truly decisive as opposed to huge media giants. Manuel Serrano: Uruguay’s Pepe Mújica recalls that "there is no final defeat or triumph". What can the opposition and human rights defenders do to ensure that Brazil remains the largest democracy in Latin America? Reginaldo Nasser: It is understandable that some are panicking at seeing a man who is a warmonger and who threatens his opponents. Some remember 1964, and rightly so, since Bolsonaro has been open about his praise of Colonel Ulstra, a symbol of torture in Brazil. Young people seem surprised: after all, was the dictatorship not a thing of the past? We need to watch out, but we must not allow fear to paralyze us - which is precisely what terror aims for. Nor should we forget that the winning candidate got about 40% of the total votes. And that, excluding the null and blank votes and the ones of those who did not vote for him; Bolsonaro obtained 55% of the votes, against Haddad’s 45%. Bolsonaro has been open about his praise of Colonel Ulstra, a symbol of torture in Brazil. The votes of the PT candidate came mostly from the northeast, from the poorest and from women. Brazilian society is divided and we must be aware that the PT won four consecutive presidential elections, and that it would have probably won again this year if Lula had been able to run. I think this is an unprecedented fact in Brazil, and possibly in the world, where alternation of power between parties is usually the norm. We need therefore to differentiate between discourse and actions, although it is true that words and gestures configure a state of opinion in society that encourages people to act on their own. There are elements and gestures in Bolsonaro's speeches that are typical of fascism. So far, though, we cannot say that there are any coordinated fascist actions. I think he will try to act "within the law", since there is a permissive enough institutional structure within the State to allow him to carry out a real "witch hunt". Hence the importance of the pressure that the international community may be able to exert. If we agree that the character of the current actions by the far right is markedly international, the democratic struggle must assume the same form.